Congratulations to Professor Val Jenkins! Dame Lesley will be awarded the Umberto Veronesi Foundation prize at next year's St Gallen International Breast Cancer Conference, which will take place in Austria in March 2019. Prof Veronesi, who died in 2016 aged 90, contributed enormously to the research showing that all women with breast cancer did not necessarily need to have a mastectomy. Prof Dame Fallowfield is being given the award in recognition of her leading role in advancing science and care of breast cancer patients. Commenting on the award, she said: "I am absolutely thrilled and immensely proud that the Awards Committee have nominated me, a psycho-oncologist rather than a surgeon, for this prestigious award. I knew Prof Veronesi well and he was always very kind and encouraging to me in the early stages of my career. I am sure that the title of my talk 'how heretical thoughts and challenging orthodoxy improves breast cancer care' would make him smile." Four of us went to BPOS (British Psychosocial Oncology Society) annual conference this year. 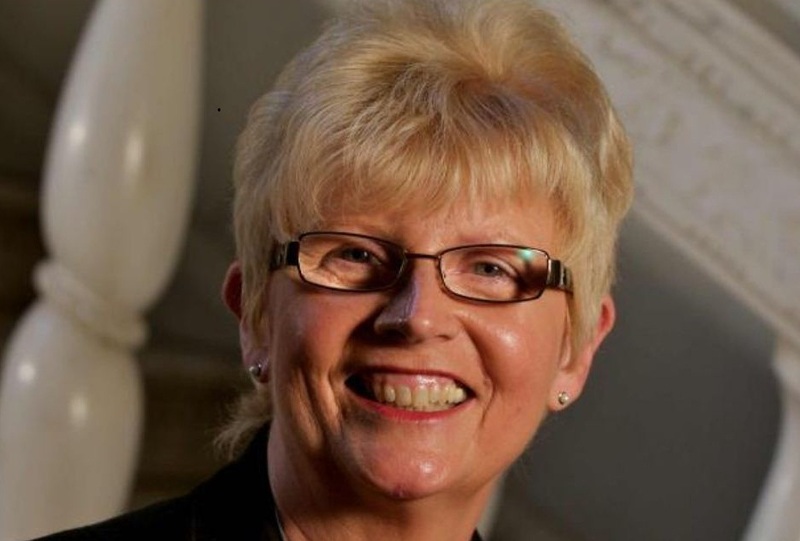 Our director, Professor Dame Lesley Fallowfield, was awarded a BPOS Lifetime Membership Award. Lucy Matthews gave a talk on ENDOPREDICT and Rachel Starking displayed our PEPSIN poster. You can read more about the conference here. SHORE-C is sorry to see the well-earned retirement of Tracy Woodcock. For most women, being diagnosed with breast cancer causes significant emotional stress. The pressure of making important decisions about treatments, which often come with distressing side effects, can increase anxiety. 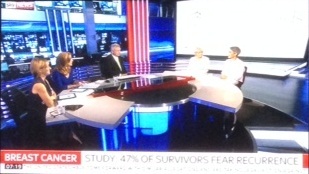 Dame Lesley Fallowfield discussed her research into the psychological impact of breast cancer and showed how doctors can minimise stress by improving communication around risk and uncertainty of test results and recommended treatments. Dr Val Shilling presented a poster at the 20th annual European Congress of International Society for Pharmacoeconomics and Outcomes Research in Glasgow on 8th November 2017. 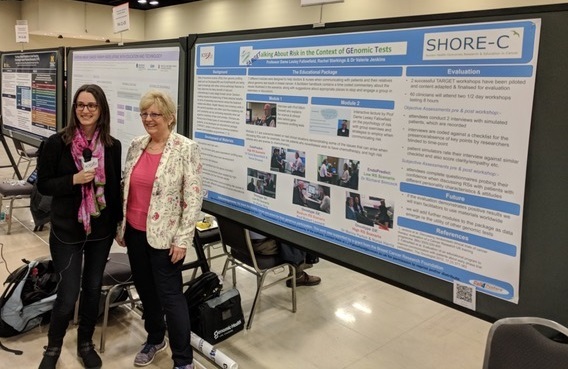 The poster titled “Evaluation and validation of the PROACT measures for cancer patients and informal caregivers” describes the development of two new scales measuring broad life impacts of cancer and cancer treatment for patients and informal caregivers. Best poster prize for Lucy Matthews for her AVALPROFS poster. What a great end to a great conference! 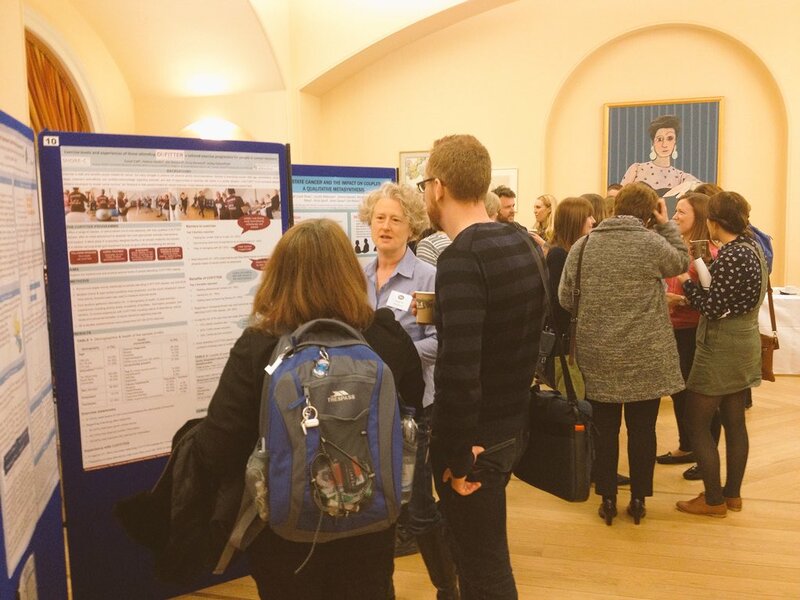 Sue Catt explaining the CUFitter poster at the BPOS conference. SHORE-C researchers are collaborating with Cancer United, a cancer patient support group based in Littlehampton. Do drugs that offer PFS or modest OS benefits improve quality of life in patients with advanced cancer? Uncertainty about the future for patients with advanced cancer and their informal caregivers: A qualitative view. Measuring the impact of extended cancer survival on broader aspects of life and wellbeing: The PROACT Study. 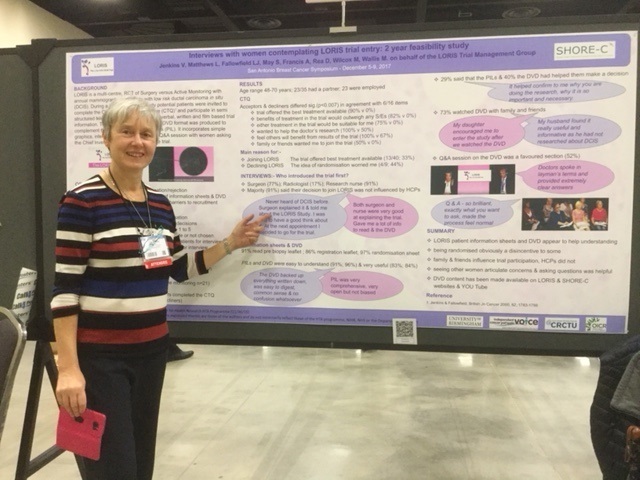 Dr Val Shilling presented a PROACT poster at the International Society for Quality of Life Research (ISOQOL) 23rd Annual Conference in Copenhagen, Denmark. Read more on the PROACT page. Rachel Starkings also presented this poster at the Inaugural Postdoctoral Research Day on the 2nd of November 2016. 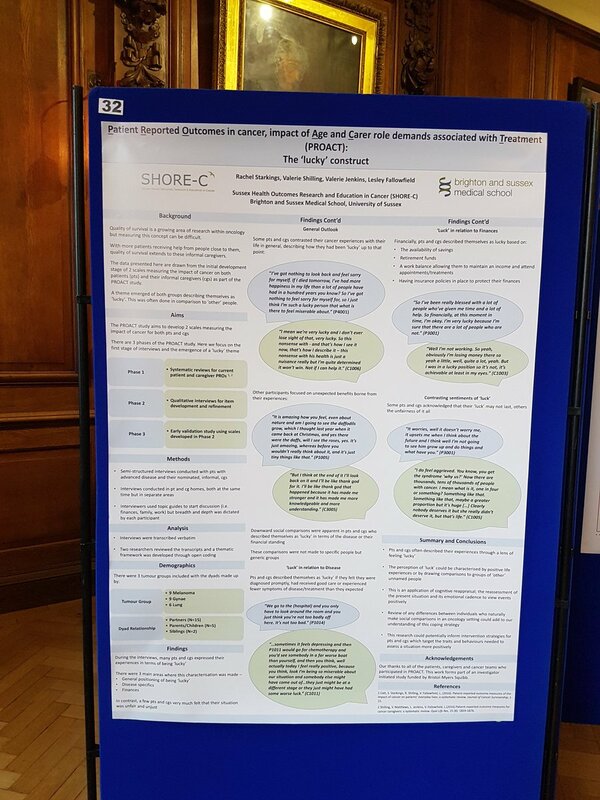 The poster explored the first two phases of the PROACT study and was awarded first prize on the day. More information on the study can be found on the PROACT page. 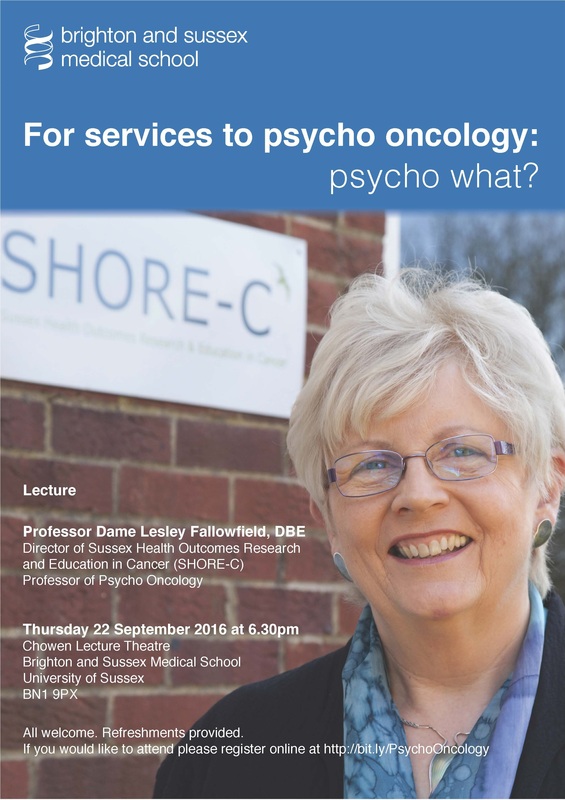 It was a full house for Professor Dame Lesley Fallowfield's lecture 'For services to psycho-oncology' Psycho what?' which took place on 22 September 2016. 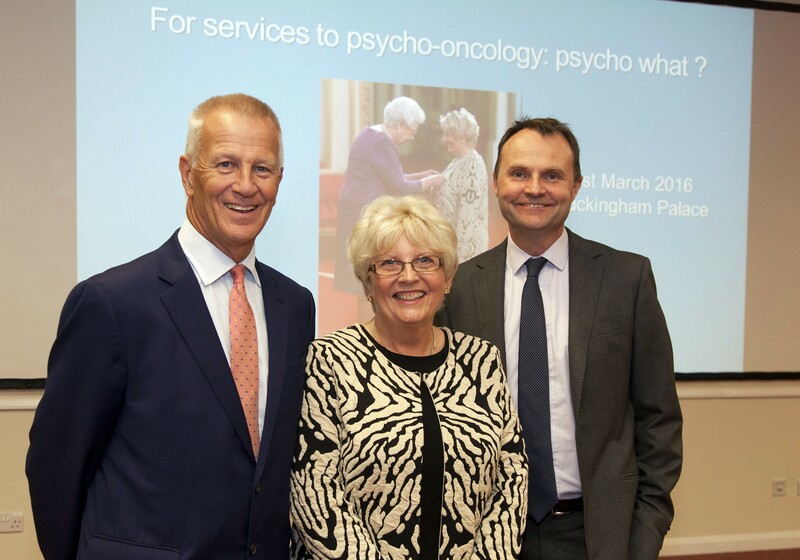 Dame Lesley gave a fascinating account of her career to date alongside a parallel history of the field of psycho oncology. Professor Dame Lesley Fallowfield has been awarded a prestigious Breast Cancer Research Foundation (BCRF) grant of $250,000 annually. The BCRF is the highest rated breast cancer organisation in the US and eminent researchers are invited to apply for funding. Dame Lesley proposed two distinct projects. One is to produce a communication-skills DVD/workshop for clinicians discussing genomic test results with breast cancer patients; the other working with Dr Melanie Flint at Brighton University and UK breast oncologists, will examine the psycho-neuroimmunological and biological factors underpinning personalised supportive interventions for women with breast cancer. Talking with Patients about Metastatic Bone Disease (MBD) workshops were facilitated by Professor Dame Lesley Fallowfield on Monday September 19th (Prostate Cancer) and Tuesday September 20th (Breast Cancer) at the RNLI College in Poole. The pilot workshops were aimed at clinicians and nurses treating and caring for breast and/or prostate cancer patients with Metastatic Bone Disease (MBD). The workshops used a set of 5 newly created educational videos illustrating different MBD consultations. The scenarios do not show the “right” or “wrong” way to discuss MBD but are used as “triggers” to engage participants in discussion. DAME COMMANDER OF THE ORDER OF THE BRITISH EMPIRE - Professor Lesley Jean Fallowfield. "Professor Fallowfield, Professor of Psycho-Oncology at Brighton and Sussex Medical School, is an exceptional scientist who has transformed the way health professionals communicate with cancer patients and improved their quality of care. She has pioneered quality-of-life assessment in cancer trials and the tools she has developed for this are now used worldwide. Her work has also significantly improved the recruitment of patients into clinical trials. 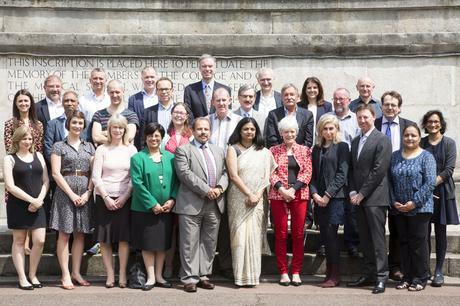 She was Chair of the British Breast Group, which brings together UK experts in breast cancer, and sits on numerous panels, advisory boards and guidelines development groups that aim to ensure quality cancer care for patients." 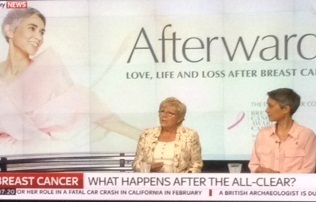 Professor Lesley Fallowfield appeared in the Sky News Sunrise programme on 1st October 2015 as part of the Estee Lauder Companies' UK Breast Cancer Awareness Campaign which asks the difficult question, ‘What happens afterwards?’. 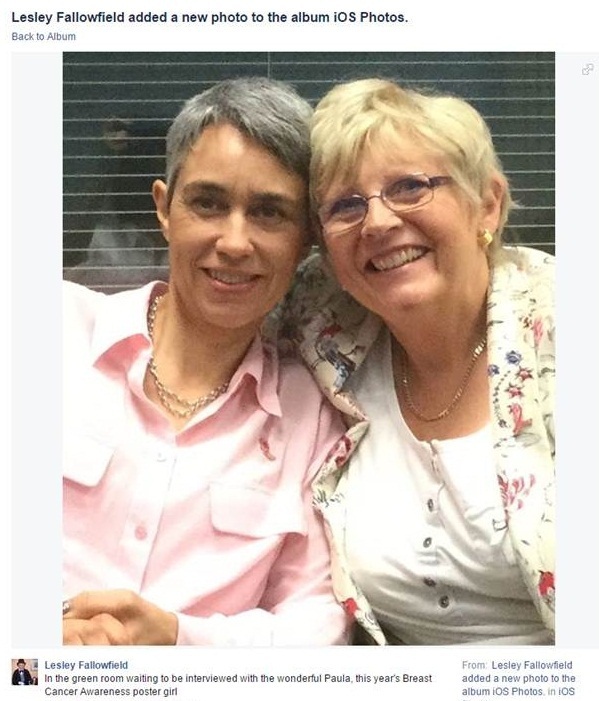 Lesley Fallowfield posted this photo of herself with Paula Beetlestone in the Green Room waiting to appear on London Live. Professor Lesley Fallowfield is quoted in two articles relating to changes in the Cancer Drugs Fund recently announced. Please click on the article titles below to read them in full. A blurring of professional boundaries can affect young cancer doctors’ objectivity when treating patients, according our online survey completed by 338 young (under the age of 40 years) oncologists throughout Europe in August. Results showed that 60% felt that if doctors were too empathetic then they could not make objective decisions, while 59% also thought it difficult to be truthful about prognosis if they particularly liked a patient. Despite this, around a quarter of respondents had treated family members, and a third had treated friends. Most allowed patients to use their first name, and 60% allowed patients to hug or kiss them in greeting or saying goodbye. Such behaviours are not always wrong but could be liable to misinterpretation in a highly charged clinical setting. The rise of mobile technology and social media may add to this blurring of boundaries, with more than half (55%) the doctors admitting they had given their personal mobile numbers to patients and 14% even accepting invitations from patients to be ‘friends’ on Facebook. The commentary is published in the 1st December issue of The Lancet Oncology. This article was further reported in The Times Health News section on Monday 24th November 2014 and by BBC World Service radio the same morning in the 'World Update' programme (47 minutes 36 seconds into the episode). Niamh Foley from University College Cork, Ireland presented her PATI-project development and demonstrate an iPad application for breast cancer patients. Niamh, a graduate of Trinity College Dublin and has been engaged in postgraduate surgical training since 2008. During a full-time MD, Niamh had the opportunity to work with Mr Mark Corrigan, Consultant Breast Surgeon at Cork University Hospital and PATI was developed with financial support from the Translation Research Access Programme in University College Cork School of Medicine. It is anticipated that this system will empower patients, targeting health literacy to reduce anxiety, increasing their knowledge and improving their capacity to consent to medical/surgical intervention. 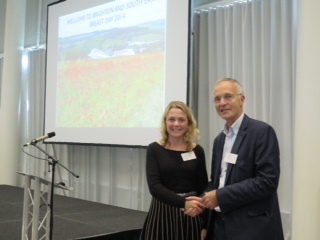 LUCY MATTHEWS, Clinical Trials Co-ordinator here at SHORE-C, has won the prestigious ABS (Association of Breast Surgery) Prize for Best Oral Presentation at the Brighton and South East Breast Day. The event was held at the AMEX Stadium on 3rd October. 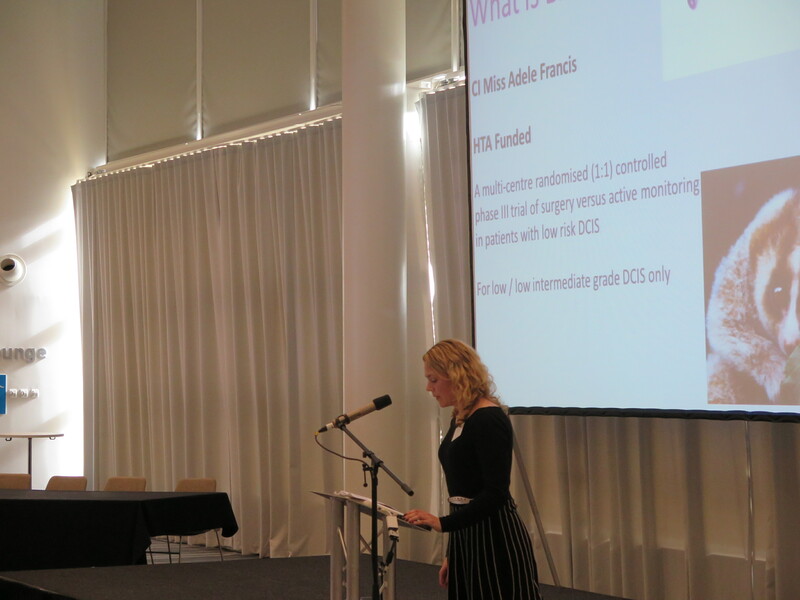 Lucy's talk was on What’s in a name: how to accurately describe low grade Ductal Carcinoma in site (DCIS) to patients in relation to the Low Risk DCIS Trial (LORIS) Lucy is the QoL Trial Co-ordinator on the LORIS trial, just opening. The Prize was awarded by ABS Hon Sec Mr Simon Cawthorn. 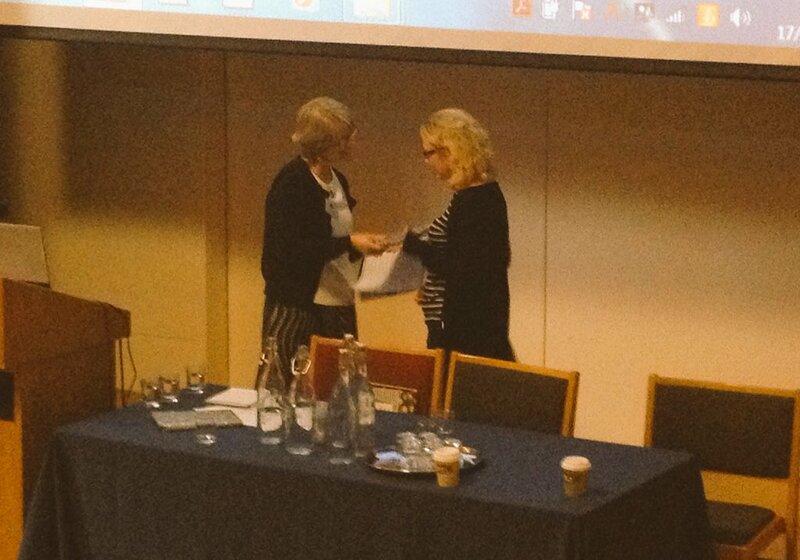 Professor Lesley Fallowfield's gave a plenary lecture entitled "Psychosocial/Survivorship Issues: are we doing better?" at the 36th Annual SABCS Dec. 10-14,2013.